Stock Market Candlestick Patterns & Charts for Stock Trading Explained for You! Candlestick patterns, as with all charting methods, are subject to the interpretation of the user. 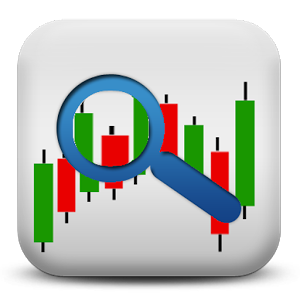 Experience with candlestick charts will show you which of the patterns and their variations, works best in your trading. Candlestick charting is not designed to be a complete system; they are just one weapon, a very powerful one, to use in your stock trading battles in the stock market. This section discusses only a few of the scores of candlestick chart patterns. 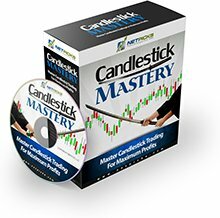 There are many important candle patterns and candlestick trading tactics not discussed in this candlestick charting basics introduction, however there are excellent resources that will help you in great detail with candlestick patterns and trading techniques. As such, do not stock trade based on the limited information. The goal of this section is to illustrate how candles can open new and unique analytical doors, not to provide a trading methodology. The broadest part of the candlestick line is the real body. It represents the range between the session's open and close. The thin lines above and below the real body are called the shadows. The peak of the upper shadow is the high of the session and the bottom of the lower shadow is the low of the session. The color and length of the real body reveals whether the bulls or the bears are in charge. Note that the candle lines use the same data as a bar chart (the open, high, low and close). Thus, all Western-charting techniques can be integrated with candle chart analysis. A critical and powerful advantage of candle charts is that the size and color of the real body can send out volumes of information. 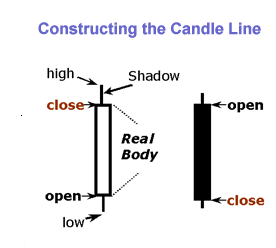 While the real body is often considered the most important segment of the candle, there is also substantial information from the length and position of the shadows. For instance, a tall upper shadow shows the market rejected higher prices while a long lower shadow typifies a market that has tested and rejected lower prices. The powerful fact is that candle charts will often provide reversal signals earlier, or not even available with traditional bar charting techniques. Even more valuably, candle charts are an excellent method to help you preserve your trading capital. This benefit alone is incredibly important in today's volatile environment. With candle charts, one can use candle charting techniques, or Western techniques, or a combination of both. This union of Eastern and Western techniques provides you with uniquely effective tools to help enhance profits and decrease market risk exposure. Return from "Candlestick Patterns" to the Home Page: "Stock Market For Beginners"